What Should I Know About FHA Jumbo Loans? If you have never heard of an FHA Jumbo Loan, you’ll be interested to learn that this is a mortgage which exceed the county limit for mortgages in a given zip code. You may be eligible to apply for an FHA home loan in excess of FHA loan limits, but there are things to understand before you apply. August 12, 2017 - If you have never heard of an FHA Jumbo Loan (known to lenders as a “non-conforming loan”) you’ll be interested to learn that jumbo loans are mortgages which exceed the county limit for mortgage loans in a given zip code. You may be eligible to apply for an FHA home loan in excess of FHA loan limits, but there are things to understand before you apply. In many ways, FHA Jumbo Loans are similar to standard FHA mortgages, including the restriction on cash back to the borrower. Some want to know if it is possible to apply for an FHA Jumbo Loan that exceeds the value of the home, with the idea of taking the remainder of the mortgage loan out in cash at closing time. Like regular mortgage loans guaranteed by the FHA, FHA Jumbo Loans are specifically designed to prevent cash back to the borrower at closing time except in the form of legitimate refunds, such as for items paid for up front but later included in the loan amount. Borrowers are entitled to that exact sum refunded to you at closing, but nothing additional. In other words, when you are apply for an FHA Jumbo Loan, the “no cash back” rules would apply the same as a traditional FHA mortgage. FHA Jumbo loans have costs which may be higher than typical FHA mortgage loans, and depending on the participating FHA lender, jumbo loan FICO score minimum requirements may be higher. Borrowers who aren’t sure if their FICO score qualifies for an FHA Jumbo Loan should discuss specific lender requirements with a loan officer. You can also get pre-purchase counseling by calling the FHA directly at their toll free number (1-800 CALL FHA) and requesting a referral to a local, HUD approved housing counselor. According to the FHA official site, no down payment assistance is permitted on FHA mortgages above $417,000. 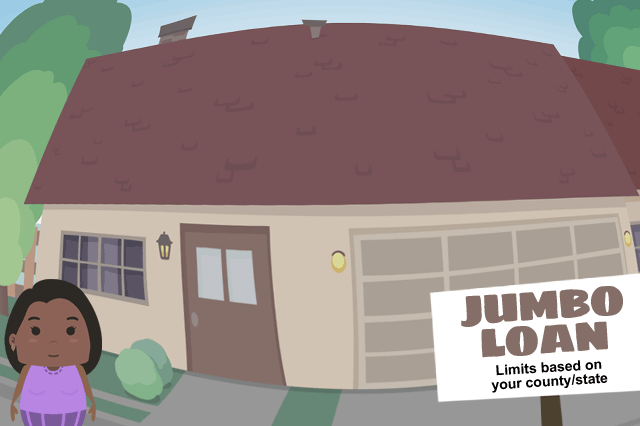 Jumbo Loan borrowers should plan on budgeting for the full down payment requirement for these non-conforming loans. FHA loan limits are not standardized across the nation-the homes in some housing markets cost more, others less. What constitutes an FHA Jumbo Loan amount in Hawaii may not be the same as what is considered typical in a less expensive housing market. FHA Jumbo Loan amounts will vary based on the by-zip code maximums permitted in that housing market. Talk to a loan officer about what is possible in your housing market, or the market where you want to explore purchasing a home.